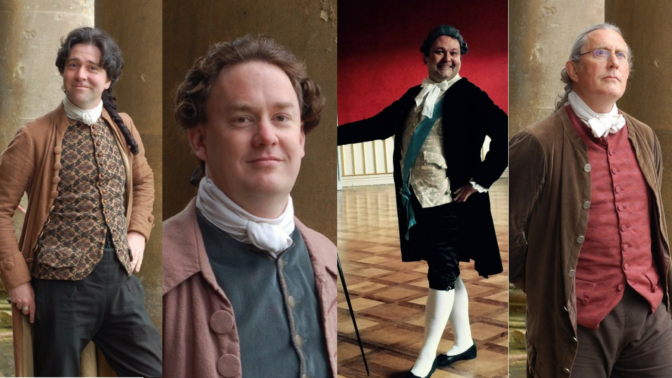 We are DELIGHTED to welcome back Stuart, Richard, Chris and Matthew for a second ‘Dances of Poldark’ weekend! This weekend is for dancers of all abilities to learn and enjoy some of the elegant and lively 18th Century dances featured in the BBC’s adaptation of Winston Graham’s ‘Poldark’ novels. Led by dancing-master Stuart Marsden, choreographer of the BBC Poldark series. The house band have all appeared in Series One and Two of ‘Poldark’. Matthew Coatsworth (violin) also plays in Boldwood. Chris Green (guitar) plays in The Playford Liberation Front and GreenMatthews. Richard Heacock (violin) recorded the dance music for ‘Poldark’, and is a regular tutor (with Paul Hutchinson and Karen Wimhurst) on the successful ‘Playing Playford’ courses at Halsway.